Water in a bathtub in the basement of a building that once served as a bowling alley constantly projects wavering reflections of light onto a stone wall. Surely one of the most bizarre settings imaginable. When the stage is darkened, a “thing” that is loaded with chairs and little cabinets comes creeping up slowly and with creaky sounds from the right side of the back, while the massive columns and beams form a perfect proscenium arch.As it is dark, one can’t really see how exactly the thing moves at first, which gives it the spooky appearance of a poltergeist. 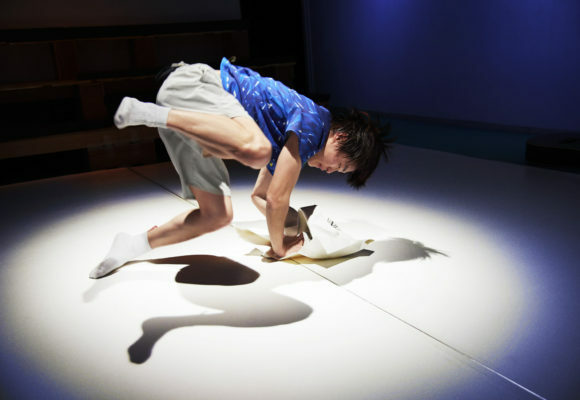 After a while one understands that it is Tomoko Ando who maneuvers the whole thing while lying under a square board the size of about two tatami mats. And it’s anything but a smooth journey. After bumping several times against a faucet on the left-hand side, and only after sliding back into the center of the stage, the performer finally reveals all of her body, only parts of which – mostly hands and feet – have been visible up to this point. She crawls through chairs and tires, and finally climbs onto the tilted board, where she brushes her teeth, drinks water, and does other things while balancing on the shaky surface that she seems to be unable to move away from. The scenery is a visual allegory of an island. It does look like an island that is surrounded by raft in the beginning, and later by various driftage, but one can perhaps also see it as a special kind of dress, as the size of it was determined based on Ando’s own physical sensation. 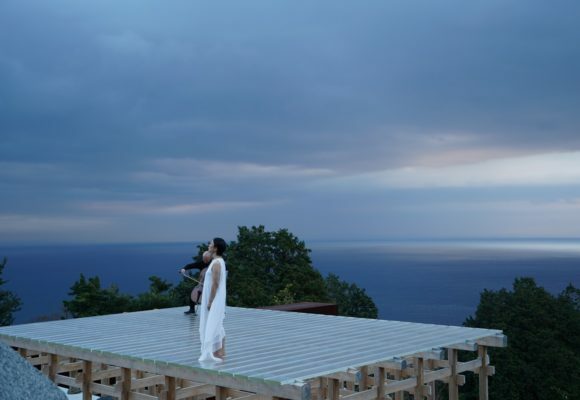 In “Shiawase na hibi,” ARICA’s rendition of Beckett’s “Happy Days” that was realized together with artist Teppei Kaneuji, Ando was standing so deeply in a mountain – or was it a giant dress? – of what looked like wreckage that she could barely move. 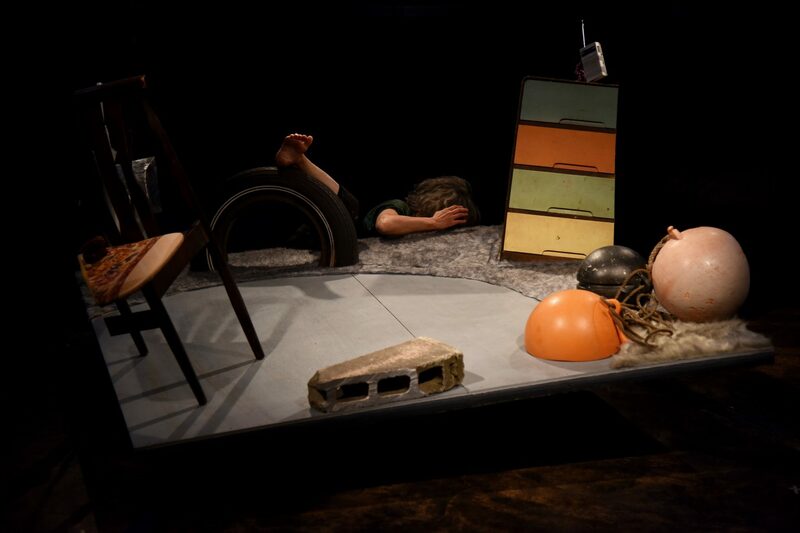 Her collaborator this time is Nao Nishihara, who also contributes some rather punchy “sounds.” The result is a movable “stage” complete with furniture, and as Ando is constantly attached to it no matter how hard she tries to get away, the entire device functions as a restraint of sorts that Ando is a slave to throughout the show. 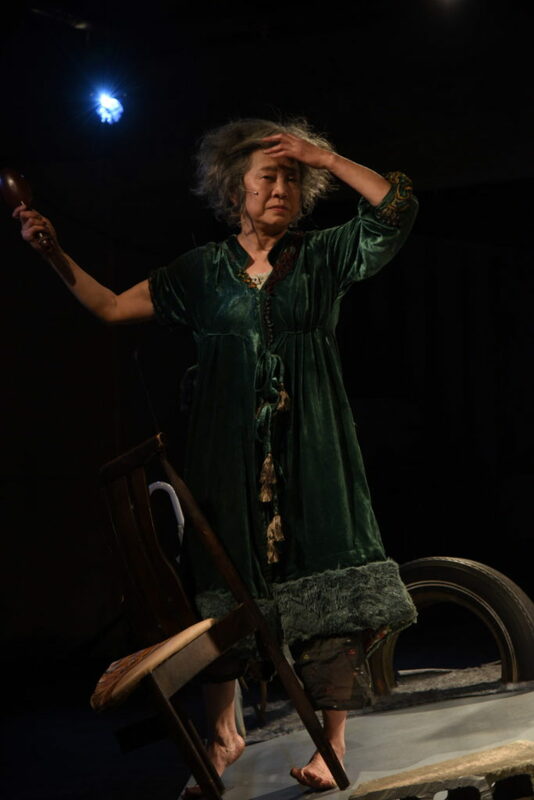 The actual costume – made by designer Yoko Ando – that the actress wears is green. In the talk session after the performance, there were questions about her looking like a turtle that carries an island on its back (which may be a reason for the green color), but it was probably also supposed to symbolize the natural setting of an island. Anyway, it was definitely an appropriate color for a woman who united with – or better, operated with the awareness of – an island. The rectangular island is surrounded by an invisible wall of vertically cut pieces of furniture. Things are only allowed to exist inside. But then we see the body of Tomoko Ando as it crawls out from underneath the board, slips through the wall, and eventually crawls back under the board. Could it be that this is a body that no longer exists as an object? On the other hand, it does look very much alive as it balances on the tilted surface and holds on. It is a body suspended in the space between life and death. Just like “Ne Anta,” another Beckett-inspired piece, “On the Island” speaks with the voice of a woman. What she speaks of is the memory of an island. 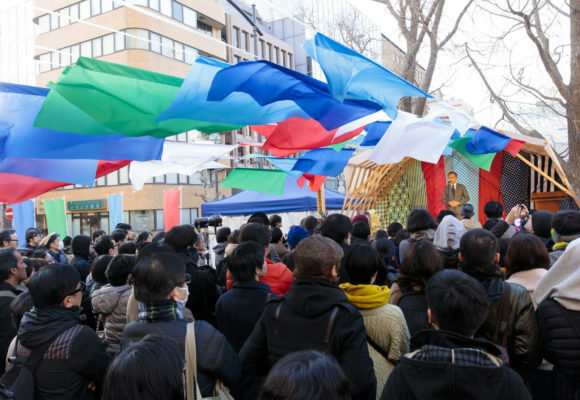 For that matter, the piece resonates the general theme of the Aichi Triennale 2013, which I was involved in as artistic director: “Awakening – Where Are We Standing? 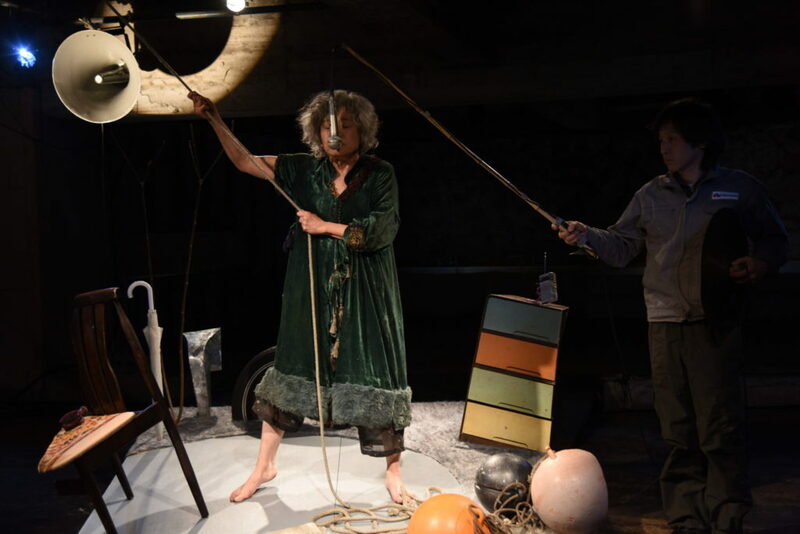 Earth, Memory and Resurrection.” “On the Island” is also related to things like the history of Okinawa and refugees, however it doesn’t name them in concrete terms. The piece is thus open to various interpretation, and I guess there are people who are reminded of a small private room in a big city. As for myself, the prediction that the population of Japan will theoretically be zero after the year 3000 if the birth rate remains unchanged inspired me to see it as an image of Japan in the distant future. Architectural historian and critic, was born in 1967 in Paris. Professor at Tohoku University. Commissioner for Japan pavilion at the Venice Biennale of architecture 2008. Artistic director of Aichi Triennale 2013 Publications include “Contemporary Japanese architects : Profiles in design”, “Architecture and Music” etc.